CARBONDALE—A traffic stop in Carbondale May 11 led to the arrests of the two Topeka women in the car and three other people suspected of being involved in area thefts. 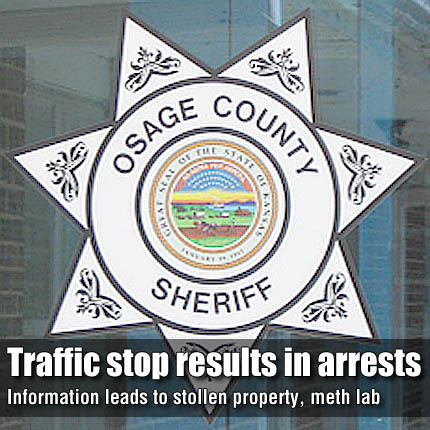 According to Osage County Sheriff Laurie Dunn, an Osage County deputy stopped a vehicle driven by Jayme Broxterman, 23, Topeka, about 1:30 p.m. in the 500 block of south Topeka Avenue in Carbondale. Dunn said she did not know the reason the deputy made the traffic stop, but Broxterman was taken into custody on charges of no proof of insurance, transporting an open container, and possession of stolen property. A passenger in the car, Kayla Schnegelsiepen, 22, Topeka, was arrested on charges of transportation of an open container, possession of methamphetamine, possession of drug paraphernalia, and possession of stolen property.